The LARGE TWIST SET contains a pair each of 5" tips 2.75 mm - 10.00 mm. All Chiao Goo TWIST sets include 5″ (13 cm), surgical-grade, stainless steel, lace tips and three cable lengths to make 24″ (60 cm), 32″ (80 cm) and 40″ (100 cm) circulars. TWIST red cables are memory free! They consist of a multi-strand, steel cable coated with red nylon. 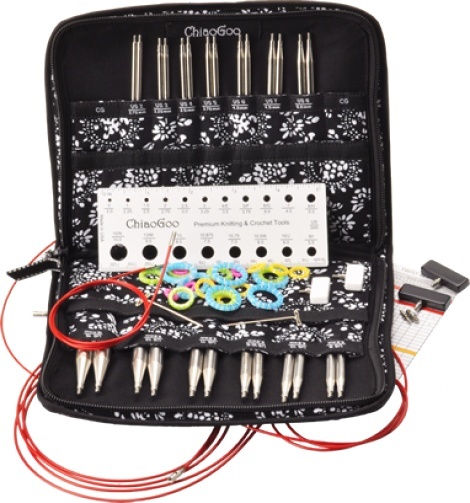 Also included with each set are easy-to-read, coded cable connectors, stitch markers, a needle gauge and end stoppers to mind your project.